I cocoon myself in warm blankets and lay down on the couch in front of the television. Every time I swallow, it feels like a hundred million tiny little daggers are stabbing me in the throat. I am certain I have never felt this ill in all of my life. I dose myself with NyQuil, knowing that the best thing I can do is sleep away the day. My head is fuzzy. My dad is changing the channels on the television. He's breathing hard. He's being weird. Why is he even at home? I try to focus my eyes on the clock, but my vision is a little wonky from the medication. My head feels like it weighs two tons. He's saying something about a plane. Or bombing. He's not sure. That's when my vision focuses. I see in front of me two buildings, I can't remember the exact name for some reason, but I know they're in New York and that when we went there a few years ago we used their bathroom. World Trade Center. My dad said it. For a moment, I think I'm only seeing footage of the bombing in the 90s. But it's not. It seems to be happening...now. My dad and I sat in silence. Staring at the television. To this day, I cannot tell you what the early reports said. I was positive that this was some tripped-out dream. That it was a result of being horridly sick, not sleeping, and being under the influence of cold medication. That any minute I would wake up. But, I didn't. This horror, this tragedy, this thing too horrible to be really happening - it was. Last year around this time I either tweeted or Facebook'd that my husband and I wondered how we would ever explain to our son the tragic events that unfolded that morning on September 11, 2001. Ten years later, he's much too young to understand it, but some day (a day not that far away) he will have to understand the world he lives in. He's never lived in a world where this hadn't happened. In a country that wasn't at war. Though I can't say I've ever been overtly patriotic, I can definitely say that I have always enjoyed living in this country of freedom and choices. And it's always been very hard for me to swallow that there are people in this world who don't like our ways and who have shown us that they aren't afraid to punish us for it. It's hard for me to swallow. So how, how do I explain that to my kid? I do not like watching any of the news footage of that day. As it turned out, September 11, 2001 was also the day my doctor called my mom and told her I had mono I was in and out of school for almost a month. With nothing else to do but watch television, I saw a lot of footage of this tragic day. I don't care to revisit it again. Not out of disrespect for the victims and their families. Just for my own sanity. However, I do hope I am able to teach my son about the kindness that was born out of such evil. About the men who ran up the stairs of those buildings while everyone else was running down. About the average, everyday people on Flight 93 who became heroes on that day. About the way a nation (who prides itself on its diversities, its debates, its polarities) came together, set it all aside, and showed our strength. I think it's important for our children to understand the evil in this world - so that they can also understand the kindness, the good, the selflessness. This year, I might not be explaining this tragedy to my son. At not quite 14 months, it might be a little over his head. But some day, it will be a story I tell him. The same way my grandparents told my parents about Pearl Harbor. The same way they told me about Kennedy's assassination. The same way my son will tell of his generation's tragedy to his children one day. For now, I will make sure to never forget this tragic part of history myself. And continue to learn, to remember, and to heal. LOVE this post...had no time to sit and read a blog posting this morning but then yours popped up and I just had to read it :). You write as well seriously as you do when you're funny. Definitely may we never forget! PS - Miss you :)But I know I'm the one who owes you an email on my end. Hopefully today! I live such a long way away... in Australia and vision of those planes still has such a profound affect on me, everytime I see the footage. I remember exactly what I was doing when it happened - exactly. I wrote on this a few weeks ago - check out my blog. My daughter is five and I heard an expert on the radio this morning stating that watching the footage could traumatise young children. He didn't say don't let them see it, but said it was vitally important to say that yes terrible things happen, but we are working very hard to make sure they never happen again. Ah, we're the same age! 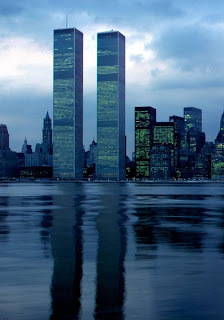 I was 17 too and will never forget that morning. My dad was also the one watching the TV with me before school that morning. It was insane. We just stood there shocked. I don't know what I'll tell my son one day, I hadn't even thought about it. Bad things happen all over the world, but we can't live in fear or the bad guys win. Thanks for sharing this post.